Zach Fettinger #88 is a player in the IMCA Modified championship battle following his third straight win. White City, Oregon...July 21...Racing into the lead from the start, Zach Fettinger scored his third 25 lap IMCA Modified Main Event win of the season Saturday night at Southern Oregon Speedway. In the process, Fettinger becomes the first driver to win more than two Main Events in one season in this division since 2015. Fettinger and new point leader Albert Gill were the six lap heat race winners, and Gill also won the four lap Trophy Dash. The Main Event was restarted after a tangle in Turn 3 involving Stan Gunderson, James Welshonse and Dave Duste Jr. Fettinger led Jantzen Knips and Duane Orsburn on the restart, and a yellow flag flew on lap two for a Chris Silva spin. Silva spun for another yellow flag on lap 4, and Fettinger continued to lead Knips and Orsburn on the next restart. A caution flag waived for debris on the track on lap eight, and Orsburn slipped past Knips for second on the restart. Silva spun one more time in Turn 2 on lap nine and was black flagged as per the track's three yellow flag rule. Fettinger led Orsburn and Knips on the restart, and Gill made a low pass in Turn 2 to take fourth from Welshonse on lap 14. Fettinger was setting a good pace up front and lapping slower cars. He took the white flag, but when Gill spun in Turn 2, Fettinger received a yellow flag instead of a checkered flag the next time by. On the one lap shootout, Fettinger led Orsburn for the 1-2 finish. Behind them, Knips was spun out and hit in Turn 2. Gill finished third, followed by Knips, Welshonse, David Satterfield, Brett Provost, Gunderson, Silva and Duste. IMCA Modifieds and Sport Modifieds are scheduled to return as part of Hall of Fame Night on August 18th. Also on the card will be the Late Models, Bobbio's Pizza Mini Stocks, JOAT Labs Hornets and OTRO Hardtops. For further information, go to www.southernoregonspeedway.com. 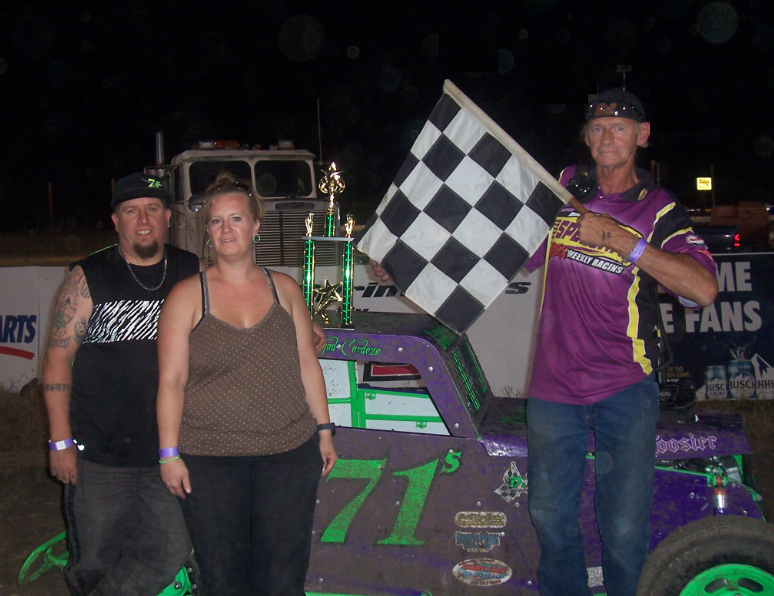 Albert Gill #89 won the IMCA Modified Trophy Dash and also took over the point lead. Heat 1-Albert Gill, Jantzen Knips, James Welshonse, Brett Provost, David Satterfield. Heat 2-Zach Fettinger, Duane Orsburn, Dave Duste Jr, Stan Gunderson, Chris Silva. Trophy Dash-Albert Gill, Zach Fettinger, Jantzen Knips, David Satterfield. Main Event-Zach Fettinger, Duane Orsburn, Albert Gill, Jantzen Knips, James Welshonse, David Satterfield, Brett Provost, Stan Gunderson, Chris Silva, Dave Duste Jr.
Chico, CA visitor Tyler Rodgers #44 made his first appearance at Southern Oregon Speedway and won the IMCA Sport Modified Main Event. 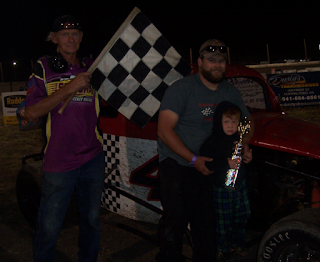 White City, Oregon...July 21...Taking the lead from Jimmy Lipke on a lap four restart, Tyler Rodgers went on to win the 20 lap IMCA Sport Modified Main Event Saturday night at Southern Oregon Speedway. He becomes the sixth different winner in six races. This was the first appearance by the Chico, California visitor. The night started with Rodgers and Lipke each winning their respective six lap heat races. Point leader David Marble picked up the win in the four lap Trophy Dash. Lipke raced into the early lead ahead of Tony Duste, but Rodgers took second from Duste on lap two. A lap three caution flag waved when Jacob Hoppes spun. Rodgers got a good run on Lipke on the restart and moved underneath him in Turn 2 to take the lead. Hoppes brought out another caution flag on lap four, and a multi-car crash botched the first restart attempt. Rodgers led Lipke and Mike Medel on the restart. Rodgers quickly built up a straightaway advantage over Lipke as Medel ran closely behind Lipke in the battle for second. A tangle involving Willie McFall and Steve Lysinger brought out the final caution flag on lap 16. Rodgers led Lipke and Medel on the restart and the lead three remained the same to the checkered flag. Previous winner Branden Wilson finished fourth, followed by David Marble, Tony Duste, Toby Judd, Tony Bartell, Michael Rule and McFall. 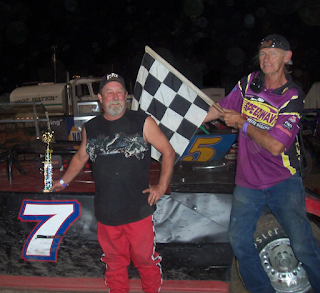 IMCA Sport Modifieds and Modifieds return to Southern Oregon Speedway as part of Hall of Fame Night on August 18th. Also on the card will be the Late Models, Bobbio's Pizza Mini Stocks, JOAT Labs Hornets and OTRO Hardtops. For further information, go to www.southernoregonspeedway.com. 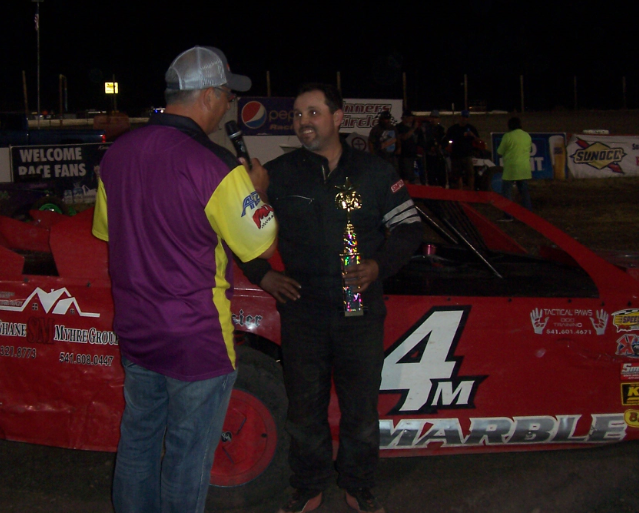 Point leader David Marble #4 is interviewed in post race ceremonies by Bryce Burtner after his Trophy Dash win. Heat 1-Jimmy Lipke, Tony Duste, David Marble, Willie McFall, Tony Bartell, Michael Rule, Steve Lysinger. Heat 2-Tyler Rodgers, Mike Medel, Billy Richey, Branden Wilson, Danny Rule, Toby Judd, Jacob Hoppes. Trophy Dash-David Marble, Jimmy Lipke, Tony Bartell. Main Event-Tyler Rogers, Jimmy Lipke, Mike Medel, Branden Wilson, David Marble, Tony Duste, Toby Judd, Tony Bartell, Michael Rule, Willie McFall, Steve Lysinger, Billy Richey, Danny Rule, Jacob Hoppes. Chad Cardoza #71 ended his victory drought and kept his SODCA Dwarf Car championship hopes alive with a much needed Main Event win. 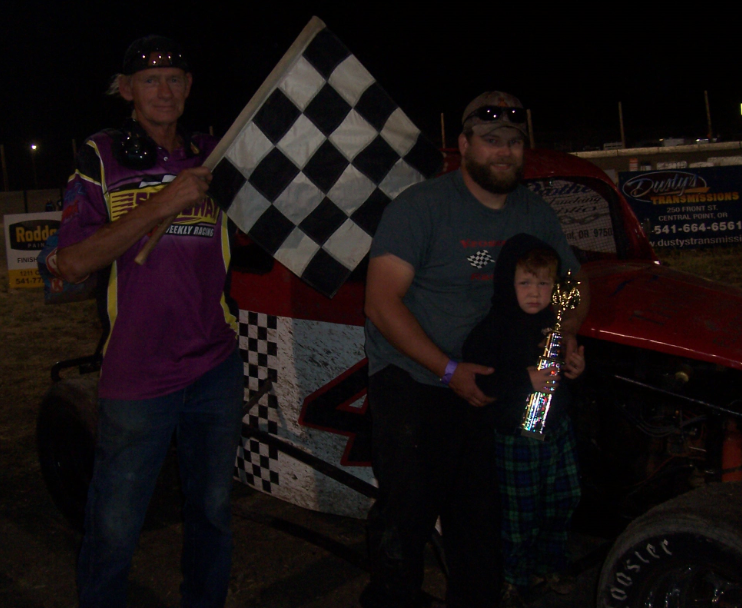 White City, Oregon...July 21...Chad Cardoza scored the victory in the 20 lap Southern Oregon Dwarf Car Main Event Saturday night at Southern Oregon Speedway. Cardoza becomes the sixth different winner in the seven races held at the speedway so far and the eighth different winner on the circuit. The 20 Dwarf Car field ran three six lap heat races, and Cardoza lost his heat race to a last turn pass by Mason Lewman. Kalvin Morton and reigning champion Brock Peters were the other heat winners. Incoming point leader Cody Peters won the six lap A Dash, and Josh King won the eight lap B Dash. A multi-car crash in Turn 2 forced a complete restart, and Cardoza led a lap before another caution flag flew. Cardoza led Lewman and King on restart. King and Lewman were battling fiercely for second and exchanged the position several times during the first seven laps. A low pass in Turn 4 of the fifth lap put King into second, and a caution flag fell on lap seven for a Brett James spin in Turn 4. Cardoza led King and Lewman on the restart, but Lewman made an inside pass in Turn 4 of the ninth lap to regain second from King. A Turn 2 spin by Cody Peters forced a lap nine caution flag. Cardoza led Lewman on the restart as Brock Peters gained third from King. Lewman made an outside pass on the front stretch on lap 11 to briefly take the lead from Cardoza. However, Cardoza made an inside pass in Turn 3 of the 13th lap to regain the lead position. Lewman headed pit side shortly thereafter as Morton was now second ahead of Brock Peters. Peters slipped past Morton for second on lap 16 with Camden Robustelli following closely into third. Brock Peters gave it a valiant effort, but he was unable to make the move as Cardoza scored a well-earned victory. Robustelli settled for third, followed by King, Cody Peters, Morton, Steve Walker, Fred Hay, Kaycee Sheeler and Ryan Smith. The Southern Oregon Dwarf Car Association will be hosting the Western States Dwarf Car Association Nationals event at Southern Oregon Speedway on August 3rd and 4th. The JOAT Labs Hornets will join in support of the Friday portion of the event, while the Kendall Oil Winged Sprint Cars and Valley Store-All Late Model Lites will be a part of the Saturday show. For further information, go to www.southernoregonspeedway.com or go to www.sodca.net. Heat 1-Kalvin Morton, Camden Robustelli, Josh King, Brett James, Kaycee Sheeler, Andrew Hall, Don Gifford. Heat 3-Brock Peters, Cody Peters, Randy Slater, Theron Smith, Mark Nielsen, Ashleigh Strain. A Dash-Cody Peters, Kalvin Morton, Brock Peters, Chad Cardoza, Mason Lewman, Camden Robustelli. 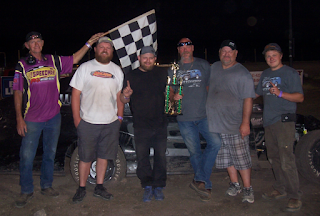 B Dash-Josh King, Brett James, Kaycee Sheeler, Michael Johnson, Mark Nielsen, Fred Hay, Ashleigh Strain, Theron Smith, 76, Ryan Smith, Randy Slater, Steve Walker, Don Gifford, Andrew Hall. Main Event-Chad Cardoza, Brock Peters, Camden Robustelli, Josh King, Cody Peters, Kalvin Morton, Steve Walker, Fred Hay, Kaycee Sheeler, Ryan Smith, Michael Johnson, Mark Nielsen, Theron Smith, Randy Slater, Brett James, Ashleigh Strain, Mason Lewman, Andrew Hall, 76, Don Gifford. 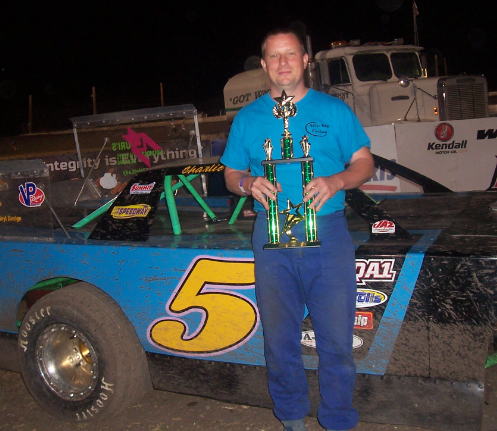 Point leader Charlie Eaton #5 won his third Valley Store-All Late Model Lites Main Event. White City, Oregon...July 21...Taking the lead from 2016 champion Lee Doty on the sixth lap, Charlie Eaton went on to win his third Valley Store-All Late Model Lites Main Event Saturday night at Southern Oregon Speedway. Eaton is the point leader, and this enabled him to increase his advantage over Greg Arnold, who finished fourth. Doty was working on a clean sweep effort as he won both the six lap heat race and four lap Trophy Dash. Doty had the pole position next to reigning champion Bob Burkett, but Burkett only started the event as he had radiator issues. Doty raced into the early lead ahead of Eaton and Burkett. Burkett pitted on lap two as Arnold settled into third. Danny Prewitt jumped behind the wheel of the #99 car and took third from Arnold on lap four, and a Turn 2 pass gained Eaton the lead from Doty on lap six. Eaton set a good pace up front and brought it home to a satisfying win, followed by Doty, Prewitt, Arnold, Eric Aos, Dusty Aos and Burkett. The Valley Store-All Late Model Lites return on Night #2 of the Western States Dwarf Car Nationals on August 4th. They will be a support division along with the Kendall Oil Winged Sprint Cars. For further information, go to www.southernoregonspeedway.com. Lee Doty #7 won the Valley Store-All Late Model Lites Trophy Dash. Heat-Lee Doty, Bob Burkett, Charlie Eaton, Greg Arnold, Danny Prewitt. Trophy Dash-Lee Doty, Bob Burkett, Charlie Eaton, Eric Aos. Main Event-Charlie Eaton, Lee Doty, Danny Prewitt, Greg Arnold, Eric Aos, Dusty Aos, Bob Burkett. 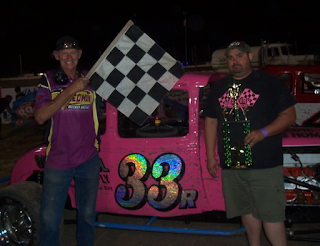 Mark Minter #33 won his second OTRO Hardtop Main Event. White City, Oregon...July 21...Taking the lead from Justin Krossman on the white flag lap, Mark Minter scored his second straight 15 lap OTRO Hardtop Main Event win Saturday night at Southern Oregon Speedway. Minter ended Krossman's bid for a clean sweep as Krossman won both the four lap Trophy Dash and six lap heat race. Krosman set the early pace ahead of Chris Mehrer, but 2016 PRA Hardtop champion Greg Hickman led Jamie Britton around Mehrer for second and third a lap later. Britton spun in Turn 2 for a lap two caution flag, and Dean Cast headed for the pits. Krossman led Hickman and Minter on the next restart, but Hickman spun in Turn 2 and collected Minter for a lap three caution flag. Krossman led Jay Smith and Britton on the next restart. A lap five caution flag flew for Mehrer, and Krossman continued to set the pace on the restart as Minter raced past Britton for second. Britton and Hickman tangled in Turn 2 for the final caution flag on lap seven. Krossman continued to lead Minter and Britton, but Hickman made a backstretch pass on Britton for third on at nine. Minter moved in and began to challenge Krossman for the lead in the waning laps, and an inside pass at the start-finish line as the white flag waved gained Minter the lead. Minter held off Krossman on the final lap for the well-earned victory. Hickman settled for third, followed by Britton, Smith, Mehrer and Cast. The OTRO Hardtops are a part of Hall of Fame night on August 18th. The stacked program will also include IMCA Modifieds, IMCA Sport Modifieds, Late Models, Bobbio's Pizza Mini Stocks and JOAT Labs Hornets. For further information, go to www.southernoregonspeedway.com. Justin Krossman #4 won the OTRO Hardtops Trophy Dash. Heat-Justin Krossman, Mark Minter, Greg Hickman, Jamie Britton, Chris Mehrer, Dean Cast. Trophy Dash-Justin Krossman, Dean Cast, Jay Smith, Chris Mehrer. Main Event-Mark Minter, Justin Krossman, Greg Hickman, Jamie Britton, Jay Smith, Chris Mehrer, Dean Cast. 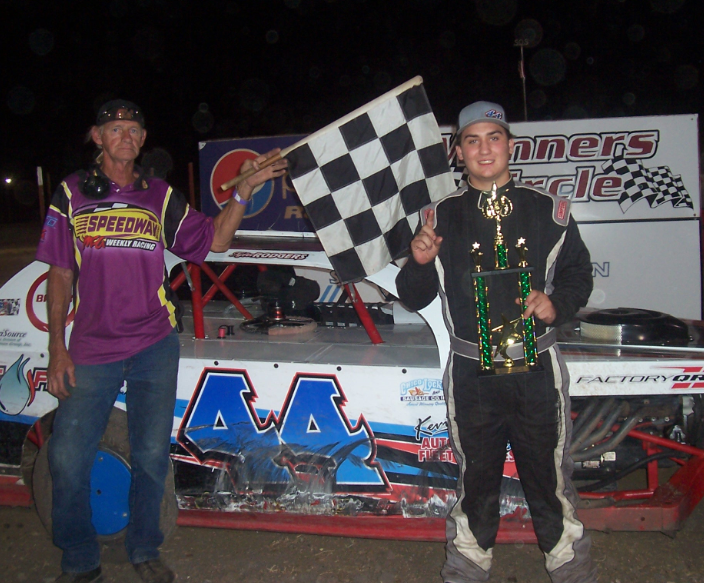 White City, Oregon...July 20...Point leader Trevor Grimes returned to the Winner's Circle in the 20 lap 250 Kart Main Event Friday night at Little Southern Oregon Speedway. This was his third win of the season and broke him out a two race slump. Grimes and Brenden Bartlett picked up eight lap heat race victories and shared the front row for the Main Event. Bartlett was subbing for Brionna Fuller, who is still unable to compete in her Cage Kart. Grimes settled into the lead at the start ahead of Bartlett and previous winner Vinny DeBenedetti. DeBenedetti spun in Turn 2 for a lap 13 caution flag, moving Landon Green into third. The lead two karts ran a good race up front until Bartlett spun in Turn 2 for a lap 18 caution flag. Grimes led the restart and paced the final laps for the win. Green finished second, followed by Cadyn Smith, DeBenedetti, Taylor Fuller and Bartlett. During the second heat race, Reece Slyter took a nasty tumble on the front straight away and made contact with the front wall after contact with another kart. Fortunately, he was uninjured and walked away from the wreckage. 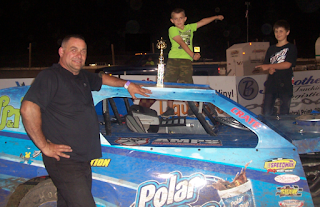 Point leader Keaton Augustine scored his third straight 15 lap Box Stock Main Event victory. Augustine and Jacob James were the eight lap heat race winners. Augustine jumped into the lead at the start of the Main Event with Ryan Hirschbock in close pursuit. James settled into third. After picking up three straight wins in the Beginners Box Stock class, reigning Beginners Box Stock champion Malachi Johnson made his Box Stock division debut and settled into fourth place ahead of Taylor Fuller. Fuller got by Johnson for fourth on lap 10. Augustine ran smooth and consistent laps and kept Hirschbock behind him for a well-earned victory. James settled for third, followed by Fuller, Johnson and Kiley Grimes. Austin Bartholomew made the trip from Crescent City, California and left with the 12 lap Beginners Box Stock Main Event victory. Uriah Sanders and Bartholomew picked up the eight lap heat race wins, and Sanders jumped into the early Main Event lead ahead of Bartholomew and Grant Proctor. The lead three karts began a good battle at the front of the pack, and Hunter Granger brought out a lap four caution flag. Sanders continued to lead Bartholomew and Proctor on the restart. Bartholomew finally made a Turn 2 pass on Sanders for the lead on lap nine. As Bartholomew sped to the victory, Sanders held off Proctor for a season-best second place finish. Shailene Horn was a solid fourth, followed by Carson Henson, Jayme DeBenedetti, Bentleigh Chapman and Granger. Steve Rambo scored the win in the 12 lap UAS Speedway Kart Main Event. Larry Fuller and Ed Grubb were the eight lap heat race winners, and Fuller settled into the early Main Event lead ahead of Rambo and Grubb. The lead three karts ran closely at the midway point of the race, and Ken Gaines brought out a lap six caution flag. Larry Fuller pitted, and Brionna Fuller spun to botch the first restart attempt. She pitted briefly and returned for the restart a lap later as Rambo led Grubb and Johnny Hoult. Grubb had problems and pitted on lap nine, leaving Rambo and Hoult as the only lead lap karts. Rambo won by a comfortable margin ahead of team-mate Hoult. Brionna Fuller rallied for a third place finish, followed by Lori Fuller, Grubb, Larry Fuller, Gaines and Bobby Hirschbock. The track introduced a Novice Beginners Box Stock classification for a few of the drivers who are just coming to speed in their first starts, and Bhaltair Edwards won their ten lap feature. Edwards and Isaac Grimes collected the six lap heat race wins, and Edwards raced into the Main Event lead at the start ahead of Grimes and Caleb Ranney. Grimes made a high pass and Turn 1 of the fifth lap to take the lead from Edwards, and he seemed poised to get the win. However, Edwards made a rally on the last lap and passed Grimes on the outside as they took the checkered flag. Edwards, Grimes and Ranney all took the checkered flag in order. The Outlaw Kart program will be back in action at Little Southern Oregon Speedway on August 10th. For further information, go to www.southernoregonspeedway.com. Heat 1a-Trevor Grimes, Vinny DeBenedetti, Reece Slyter, Brenden Bartlett, Landon Green, Taylor Fuller. Heat 2a-Brenden Bartlett, Landon Green, Trevor Grimes, Vinny DeBenedetti, Reece Slyter, Cadyn Smith, Taylor Fuller. Main Event-Trevor Grimes, Landon Green, Cadyn Smith, Vinny DeBenedetti, Taylor Fuller, Brenden Bartlett, Reece Slyter NS. Heat 1a-Keaton Augustine, Ryan Hirschbock, Taylor Fuller, Jacob James, Kiley Grimes. Heat 2a-Jacob James, Keaton Augustine, Ryan Hirschbock, Taylor Fuller, Malachi Johnson, Kiley Grimes. Main Event-Keaton Augustine, Ryan Hirschbock, Jacob James, Taylor Fuller, Malachi Johnson, Kiley Grimes. Heat 1a-Uriah Sanders, Shailene Horn, Austin Bartholomew, Grant Proctor, Carson Henson, Bentleigh Chapman, Jayme DeBenedetti, Hunter Granger. Heat 2a-Austin Bartholomew, Grant Proctor, Jayme DeBenedetti, Uriah Sanders, Carson Henson, Shailene Horn, Bentleigh Chapman, Hunter Granger. Main Event-Austin Bartholomew, Uriah Sanders, Grant Proctor, Shailene Horn, Carson Henson, Jayme DeBenedetti, Bentleigh Chapman, Hunter Granger. Heat 1a-Larry Fuller, Steve Rambo, Ed Grubb, Johnny Hoult, Ken Gaines, Brionna Fuller, Lori Fuller. Heat 2a-Ed Grubb, Larry Fuller, Steve Rambo, Johnny Hoult, Brionna Fuller, Lori Fuller, Ken Gaines. Main Event-Steve Rambo, Johnny Hoult, Brionna Fuller, Lori Fuller, Ed Grubb, Larry Fuller, Ken Gaines, Bobby Hirschbock. Heat 1a-Bhaltair Edwards, Isaac Grimes, Caleb Ranney. Heat 2a-Isaac Grimes, Bhaltair Edwards, Caleb Ranney.